Flow process chart is used in quality control to display the action sequence of physical or manual process. 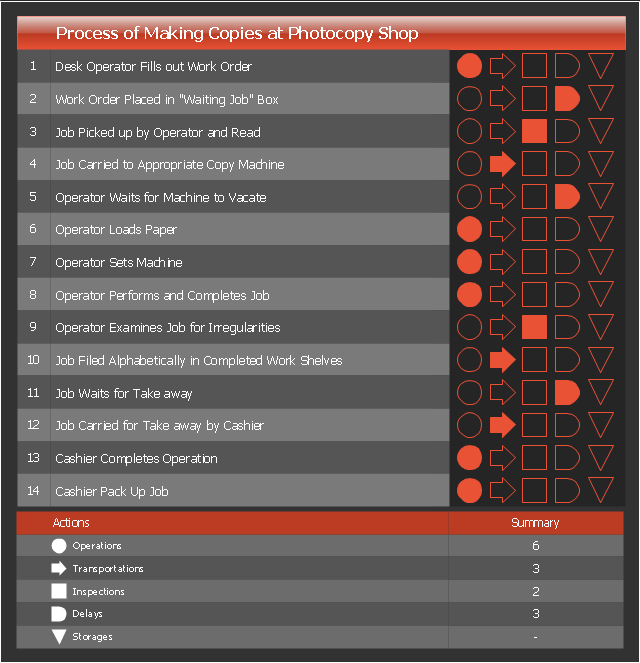 Flow process chart is useful for recording actions and documenting the production process. Flow process chart helps to analyze and improve the process steps. Flow process chart is more preferable than flowchart for documenting the mostly sequential processes. Three types of flow process charts include: 1) man-type charts depicting the person actions, 2) material-type charts displaying the actions with product or material object, 3) equipment-type charts visualizing the useage of tools and equipment. The set of symbols used in the flow process charts was developed by the American Society of Mechanical Engineers (ASME).